I spent less than 24-hours at Lewa Wilderness in the Lewa Wildlife Conservancy (Kenya), and it may have been one of my best jam-packed safari experiences to date. This is high praise because (1)I've had many great safari experiences and (2) I showed up at Lewa with a nasty cold. I started this safari with my friend (and travel agent) Jeanie and her 4-year-old daughter, Daniela, up north at Sarara where I had the beginnings of a gross cold, which reached its zenith by the time we made it to Lewa. I was the type of sick where you feel as if all of the snot in your head is visible outside of your head and obviously no one wants to say hello to you, let alone stand within a 5-feet radius. The Lewa staff, however, greeted me with open arms and sympathetic smiles. Not sure how they did that, but it eased my tension. Francis, our Masai warrior guide. Unfortunately, while in camp, I spent most of my time napping. So I did not get any shots of the camp itself, except one blurry photo of the large showerhead in my bathroom; apparently, I was very excited about that. Photos aside, Lewa Wildnerness is hard to forget; it is the place of fairy tales with thatched roof cottages. After checking in and enjoying that showerhead, I joined Jeanie and Daniela for our evening drive, with our Masai warrior guide, Francis, a man of big smiles and great skill. The Lewa Wildlife Conservancy is known for its rhinos, and it did not disappoint. That evening, with the help of Francis, we saw rhinos, buffalo, waterbuck, an elephant bull in the distance, and lion cubs. We drove to the lion cubs, parking the vehicle a respectable distance away. Francis broke out freshly made popcorn and sundowner drinks. Daniela and I made short order of that popcorn, and we whispered excited yelps every time one of the cubs surfaced from behind the tall green grass and reeds. Can you find the lion cubs? When we returned to camp, the resident giraffe, Mr. Dave, was waiting for us, munching on the foliage around camp. At this point, I was spent. Jeanie asked for dinner in her room. I hadn't thought of that myself--one of the many things I learned from traveling with a travel agent. Her request was a gift. I ate in the large family room portion of my suite by myself with my cold, and a mothering older woman brought me dinner, but more importantly brought me a massive amount of tea. She even sternly waived away a waitress who tried to serve me wine. I wanted that wine, but I didn't want to cross "mom," and mom is usually right. That night, I slept like the dead and woke up a bit refreshed. The next morning gave us clear skies, and we were able to glimpse the mountains in the far distance. The rest of the morning went as if we gave Lewa a challenge--how much can we see and do at Lewa in 3 hours. The answer is a lot. We saw a lion, a lioness, a lilac-breasted roller in the perfect photo ready spot, elephant, cheetah, and rhino with a rhino baby. But that's not all. Next, breakfast in the bush. This is always a favorite safari experience for me. 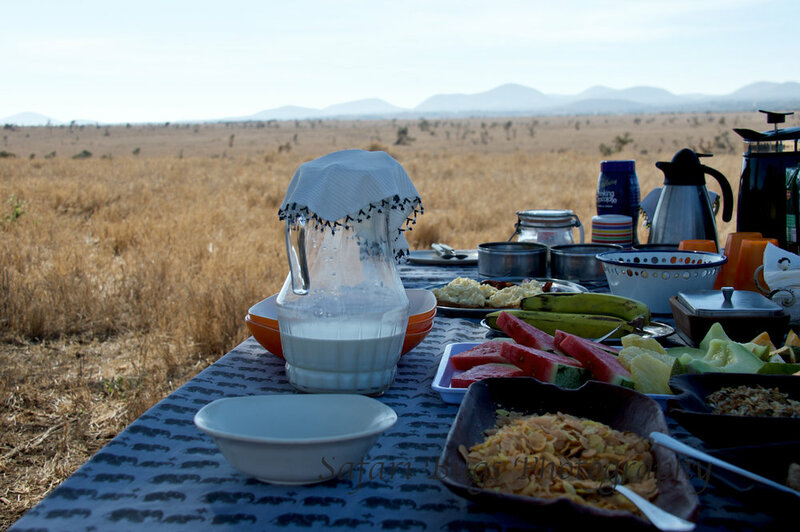 But, this was no ordinary bush breakfast. At Lewa, we ate while we watched a Masai warrior guide two camels to us. The red of the warrior walking through the bush with the two animals was one of those rare timeless sights. After breakfast, we rode the camels back to camp. But, that wasn't enough. During our ride, we passed two rare black rhinos. I have yet to meet a safari I didn't like. And thanks to Jeanie, I have yet to meet a safari destination to which I didn't want to return. Lewa Wilderness is a bit different. Lewa gave me incomparable memories and left me longing to return for longer. But next time, I'm replacing Ian for the excessive amounts of snot.